Would You Sniff Your Way to Death? Inhalants are a type of drug that can affect you in many ways. They are not considered a drug but as a poison. When used the right way they can't do damage to your health. If you use inhalants for the wrong purpose then they can give you slurred speech, dizziness, nausea/vomiting, loss of consciousness, and brain damage. There are many types of inhalants in the world. You are surrounded by them in everyday life. 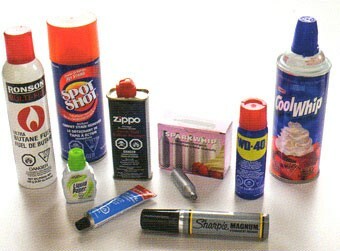 Some examples of inhalants are household products like cleaning supplies, glues, gasoline, cooking sprays, and more. They are all deadly if used the wrong way and they can even kill you. When you abuse inhalants you can die after trying it once. There are several causes of death from using inhalants. "Sudden Sniffing Death" - This common cause of death is when your heart beats rapidly and irregularly, and then stops. Asphyxia - A person will not be able to breath because toxic fumes replace the oxygen in the lungs. Choking - A person can choke on his or her own vomit. Suffocation - As vapors are being inhaled from a plastic bag that is laid on your head, the plastic bag can block air from entering the lungs. Injuries - People may make poor decisions when they get high from inhalants. They might do something mindless or insane, such as jumping off a roof. Suicide - People could become depress and kill themselves when their high wears off. In conclusion, inhalants can change you in countless ways. They can ruin your life and even kill you after trying them once. If you think a friend is addicted to inhalants, stay calm and talk to others about it like your school counselor or doctor. Use inhalants as instructed and you will have a safer life. Think first before you act.